Experience Seattle aboard the city's only private cocktail cruise. While cruising Lake Union, you'll view seaplane take-off and landings up close and see the Space Needle, Gas Works Park, the Fremont Bridge and St. Marks Cathedral. Cruise past dozens of floating homes including the Sleepless in Seattle floating home and the oldest floating home in Seattle. 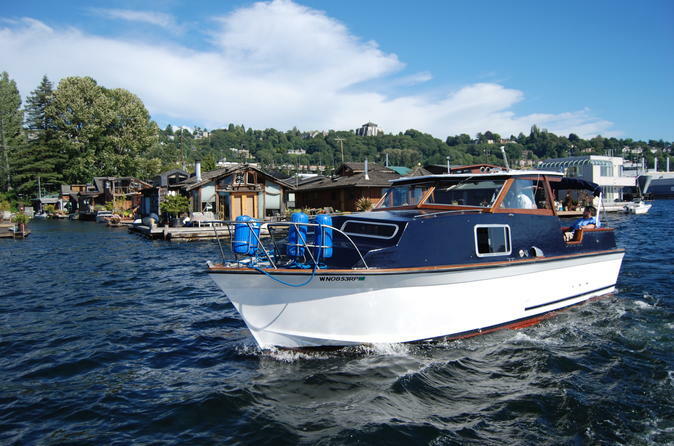 See hundreds of boats from classic cruisers to modern mega yachts from Westlake to Portage Bay and the Montlake Cut, leading to Lake Washington. Get a fantastic view of the university campus and football stadium. This is a family friendly cruise, all ages welcome.You are welcome and encouraged to bring along picnic or snack foods, or food from one of the restaurants at the pick up location. Aboard this cruise, you will be in the hands of a professional and in the lap of luxury. A talented bartender and skilled boat handler, Captain Dylan will introduce you to Seattle. Starting in South Lake Union where all of Seattle's major industries have flourished, you will cruise by boats and floating homes of all sizes, shapes and ages, including the oldest floating home built in 1907. Cocktail in hand, or "mocktail" for those not enthusiastic about alcohol or too young to imbibe, you will get a great look at UW stadium. On a clear day, Mt. Rainier will loom beautifully to the south of Lake Washington. Returning to Lake Union, you are likely to see draw bridges that are nearly 100 years old open up for sailboats and large yachts, Seaplanes taking off and landing, locals enjoying the sunshine from kayaks and stand up paddleboards. After a 2-hour journey, you will want to stay all day.